May, 2014. Mallard drake guards and watches over his mate and newly hatched ducklings as they eat. June, 2014. Same mallard hen casually strolls in grass with babies, while her mate does the "heavy lifting." Mallard drake in "combat mode" chasing off any and all mallards venturing into space and representing threat (or inconvenience) to mate and ducklings. Mama mallard relaxed with babies despite battles around her. As detailed throughout this blog, one of the prime reasons Canada geese have high survival rates among their young is because both parents are actively engaged in the rearing and protective processes of parenting. Such is usually not true in the mallard world where mama hens typically have to fend off intruders or predators, while at the same time, caring for and rearing their ducklings. A mama duck has to be sentry, protector, chaser, fighter, nurturer and teacher. This is, for sure, a tall order for a single bird. And it is probably for this reason, that many, if not most ducklings (unlike goslings) don't make it to adulthood. 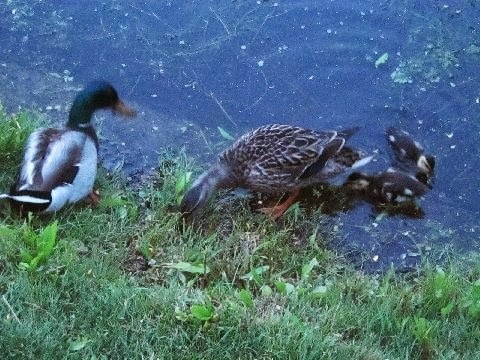 But, apparently some mallards are figuring out ways to better avoid duckling predation and protect their little ones. Last summer for example, one creative mallard hen from Harlem Meer calculated that by parking her tiny ducklings with Cago, (the lone Canada goose at the Meer at the time), she was free to chase other mallards away while her babies were carefully guarded. For her part, the peaceful Cago was not particularly engaged with the ducklings, but her size alone was enough to afford the little ones some protection while mama duck was otherwise occupied. All five ducklings made it through those tough and early weeks of life. This year, another mallard hen from Harlem Meer has apparently figured that by enticing her drake partner to stay, her two ducklings are better assured survival. I first noticed the new mallard family late last month, shortly after the two ducklings hatched. It was unusual to see the mallard drake acting very much like a goose gander does when having a mate and goslings -- protective and sentry mode most of the time. Last night, I visited Harlem Meer and saw the mallard family again. It was both, pleasing and a little surprising to note that both ducklings have grown substantially and appear to be thriving. But, after sitting down in the grass for a little while and closely observing the family, it became very clear very soon, why these ducklings are beating the odds. In short, mama duck can relax and concentrate on "child rearing" while daddy drake does all the heavy lifting, so to speak. What is meant by "heavy lifting?" Keeping the area clear of any and all other mallards, some of whom can apparently represent some threat to young ducklings. For the entire 20 or so minutes I sat in the grass, the mallard drake continuously and relentlessly ran off, chased and sent flying into the air, other mallards dumb enough to wander into the "off limits" space of protected mama and babies. I felt exhausted just watching this non-stop activity. Indeed, if this is how the drake spends most of his days and nights, its a wonder he hasn't collapsed from the sheer stress and burnout of it all. But, all the while, mama duck was completely relaxed and oblivious to the chaos surrounding her, devoting her entire attention to her two little ones. This is not in fact, the first time witnessing a mallard drake stay with his mate and ducklings through the challenging times of baby raising -- though it is highly unusual. The same was witnessed two or three years ago at the Meer. -- In fact, it might even be the same bonded duck pair. When most people talk about mallards and other ducks, there is usually mention of high casualty losses in young ducklings. Personally however, I have not witnessed much of this in the few mallard families observed over the years in Central Park. Rather, I have witnessed creativity and somewhat amazing adaptations on the part of mallards to potential threats of their hatchlings.